I blog a lot. Usually once a day, sometimes a few times a day. and sometimes days go by without a peep from me on robdarnell.com or either of the social media sites I’m active on. Lately I’ve been crossposting my blog entries from robdarnell.com to Facebook and the Joke A Day Forums where I have my own personal thread, as do many other JAD Forum members. I don’t feel like explaining what JAD is, but many of us have known each other online and in person for years. The main reason I blog is I want to keep up an online presence. I try to blog at least once a day. If I don’t already have something in mind and blogging is the next task on my checklist, I’ll just pick something random and write the hell out of it. Blogging is usually fun for me. I treat it as a hobby. It’s also good writing exercise. There are times when I feel self-conscious and I think the things I’m posting are stupid, that the people reading them are rolling their eyes and wondering what sort of mental disorder it is that I suffer from. But often, it’s the posts that I’m self-conscious about that receive the most positive reactions. There are people who try to tell you what’s okay and what’s not okay to post online. Don’t listen to those people. There’s a lot of things about myself that I don’t share online. It’s just stuff that I’m not comfortable sharing. But some people will share things about themselves that I won’t share about myself, and that’s fine. You might get negative feedback, but if you want to post about it, go for it. Is it just me or is everyone in Michigan seeing these nasty little mofos in their houses lately? I see at least one a day. It was a declaration of war when I filled a glass with orange juice last week and saw one of them floating in it. I’ve been killing them on sight ever since. No, I did not drink the orange juice. 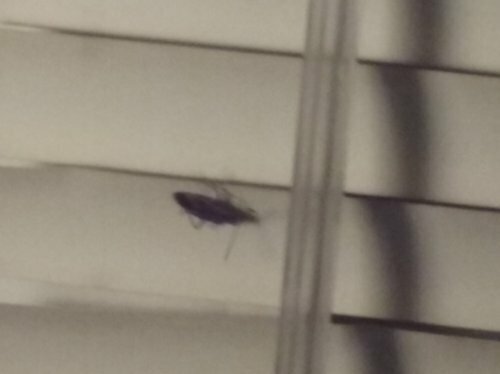 I think because temperatures have been rising and falling so much this winter, these bugs can’t decide if they want to stay underground or not and are invading our houses. Unless it’s just my house. I don’t think they’re cockroaches. I posted this in response to a couple guys on a discussion forum I’ve been active on. I half expect the forum moderators will have a word with me about it at some point, but right now I don’t care. I want to post it here as well, because I see this kind of behavior in a lot of people. I announced on Facebook some weeks ago that pretty soon I was going to tell you all about the time a horse tried to eat my finger. A bunch of you seemed to want to hear that story. I think it’s time I got the story down for you. I was probably eight at the time. I’m pretty sure I was older than seven, but not quite nine, which would mean I was eight. My dad, Fred and I were at Uncle Lynn’s house. I’m not sure if L. Y. N. N. is how his name is spelt, so someone correct me if they know for sure. Uncle Lynn had a horse. A big quarter horse. I think the horse was black or brown. For some reason I’d always had it in my head that the horse’s name was Mr. Ed, though that probably wasn’t it. Around that time, I was regularly watching the old TV show “Mr. Ed” and I probably just decided that was this horse’s name. But for the sake of this blog entry, I’ll call the horse Mr. Ed. My cousins Joel and Jason and their dad were also there. We used to always see Joel and Jason when visiting Uncle Lynn’s. Joel and me were feeding Mr. Ed apples. Joel gave him one, no problem. Though I tried to keep my hand flat when holding the apple for Mr. Ed, I guess I curled my fingers a little bit. Mr. Ed took the apple and the fourth finger of my left hand. That was one of the most painful things I have ever felt. Mr. Ed was just chewing away on my finger like it was a carrot. Thank God Joel’s dad was right there. He grabbed Mr. Ed’s jaws and pried them open with what had to be super human strength. The chewed up apple fell out and my finger was free. The next thing I knew, my dad was rushing me into the house and into the bathroom. At one point, Uncle Lynn said something about how the bite went all the way to the bone. I thought I was seeing the bone while my dad cleaned the finger, but I’m not positive. I’m also not sure it’s realistic that I could have been seeing the bone. There’s not even a scar on the finger, so probably not. They bandaged my finger, and then I was back outside. I remember talking to Fred about the incident while we stood at the pasture fence looking at Mr. Ed. I still liked Mr. Ed, but I wasn’t going to give him anymore apples. Years later, when we had horses of our own, I never let any of our horses eat an apple out of my hand. I guess that’s how you’re supposed to feed a horse an apple, but I couldn’t bring myself to do it. I’d just drop the apple on the ground and the horse could pick it up. The reason I’d been thinking about that incident is the finger Mr. Ed tried to eat has been giving me trouble in the last several months. Every since that incident, I would have a little problem with the finger, but not very noticeable. When I’d wake up in the morning and open my hand, that finger would be stuck. I’d have to use a little extra force to get it all the way up, and then I’d just have to flex my hand a few times and it’d be fine for the rest of the day. I’m not sure when exactly this started,, but sometime within the last several months, when I’d wake up in the morning it would be harder than it used to be to get the finger all the way up. And all day, any time I close my hand and then open it, the finger will lock up and I’ll have to use a little extra force to get it all the way out. For example, if I grab a glass, pick it up, have a drink and then set the glass back down. When I try to let go of the glass, my finger can still be hooked on it until I use that little extra force. So, I think it’s getting worse as I approach old age. I’ll probably see my doctor about it at some point, but I doubt any medical professional will be able to do anything short of chopping the finger off so it won’t keep getting hooked on things. I imagine an x-ray would show a deep ravine in the finger bone near where it meets the hand. I don’t see how something like that can be repaired thirty years after it had already healed improperly. 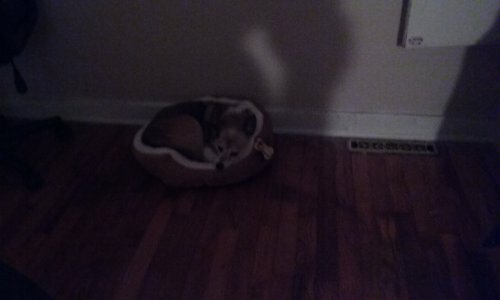 Buddy, the cat, was taking Luci’s bed a lot. Luci would often have to lie on the floor or the couch in the other room. 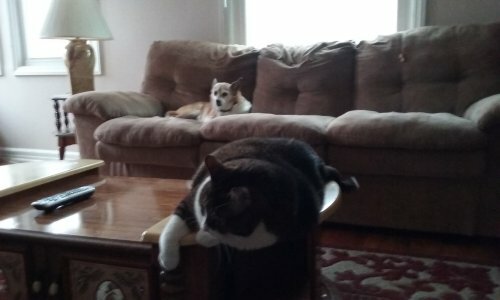 I decided to order a second dog bed, so Buddy and Luci can both have a bed in the office where I spend most of my time. The new dog bed arrived yesterday and it’s smaller than I expected. It’s actually too small for Luci. It’s probably too small for Buddy too, who is roughly the same size as Luci. But Luci doesn’t seem to mind. She spent most of yesterday in the new bed and it looks like she’s going to do the same today. I deactivated my Facebook account earlier this week. I reckon I’ll be back on Facebook eventually, but I need a long break. Facebook has been depressing lately. So many people I know are at each other’s throats. I got tired of seeing it. Both, liberals and conservatives, are partaking in this vile behavior. Hopefully it’ll calm down before long. I returned to the Joke A Day forums yesterday. Think it’s been a couple years since I was last active on Joke A Day. JADers have political arguments, but at least politics are kept separated from the other topics and won’t constantly be in my face. It’s peaceful on the Joke A Day forums and I’m glad to see that several longtime members are still active. My order from WalMart.com has arrived at last and this is one of the items. Now I just need a ride to the store so I can get some milk. 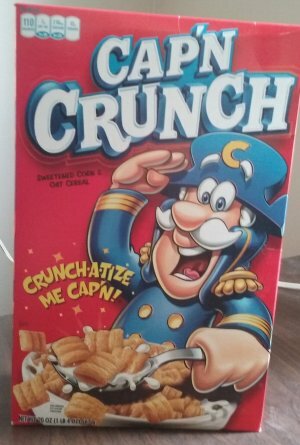 It’s been a lnng time since I last had Cap’n Crunch. I might even play the game on the back of the box. While, legally, it is the second day of the new year, being 2:37 AM and all. For me, it still counts as the first day, because I haven’t gone to bed yet. And I still have a couple more tasks to complete before I can call it a night. I’ve been busy today. Did five pages on a short story and ten pages on the novel, as well as all the chores on the list. I made a few adjustments to my daily checklist on December 31 and I decided that would be it. There would be no changes made to the checklist once the new year started, That’s the rule I made for myself. I will keep the checklist the same all through 2017, no matter how frustrating it might eventually become. Another rule I made for myself is, I can’t go to bed until every task on the list has been checked off. I’m going to do my damnedest to stick to that. Hopefully, tomorrow, I’ll have everything done earlier. Okay, now I can check off “Blog”.